Pico Naiguatá is the summit of a mountain in South America near Caracas, Venezuela, part of the Venezuelan Coastal Range, of which it is the highest peak. It is situated on the border of the Venezuelan states Miranda and Vargas. With a summit elevation of 2,765 metres (9,072 ft) and a topographic isolation of 2,455 metres (8,054 ft) above sea level, it is the highest point in both of these states and the fourth highest of the Caribbean after Pico Simón Bolivar and Pico Cristóbal Colón of the Sierra Nevada de Santa Marta range in Colombia and Pico Duarte in the Dominican Republic. ^ a b c "Venezuela, Brazil and the Guianas Ultra-Prominences" Peaklist.org. Retrieved 2012-01-22. This article related to a location in Miranda, Venezuela is a stub. You can help Wikipedia by expanding it. 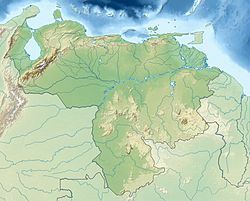 This article related to a location in Vargas State, Venezuela is a stub. You can help Wikipedia by expanding it.